A movie on hoofers in Harlem in the ’30s and 40s, and a book on rock in the ’60s — they’re featured back-to-back this weekend. Howard Sims Jr., the son of “Sandman” Sims (1917-2003), will comment on the film “No Maps on My Taps,” which features his father. Sims Jr., now 39, lives in Princeton with his wife and four children. 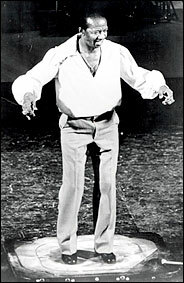 He appears in the film as a boy dancing with his father. It will be shown on Sunday, November 23, at 3 p.m. at the Princeton Public Library. Both Boyd and Sims Jr. are eulogizing lost arts. Carter quotes Boyd saying he doesn’t think popular music is as important, or as musical, as it was during his ’60s heyday. “It is nowhere near as important as it was in the ’60s,” Boyd says. “Every art form has its golden age, and I fear pop’s has passed.